Green Ossining’s 6th Annual Earth Day Festival. Saturday, April 16th. WE’VE REACHED VENDOR CAPACITY. REGISTRATION IS NOW CLOSED! Join us for A Riverfront Family-Friendly Day of Music & Activities Honoring Our Planet & Celebrating The Importance of Water! 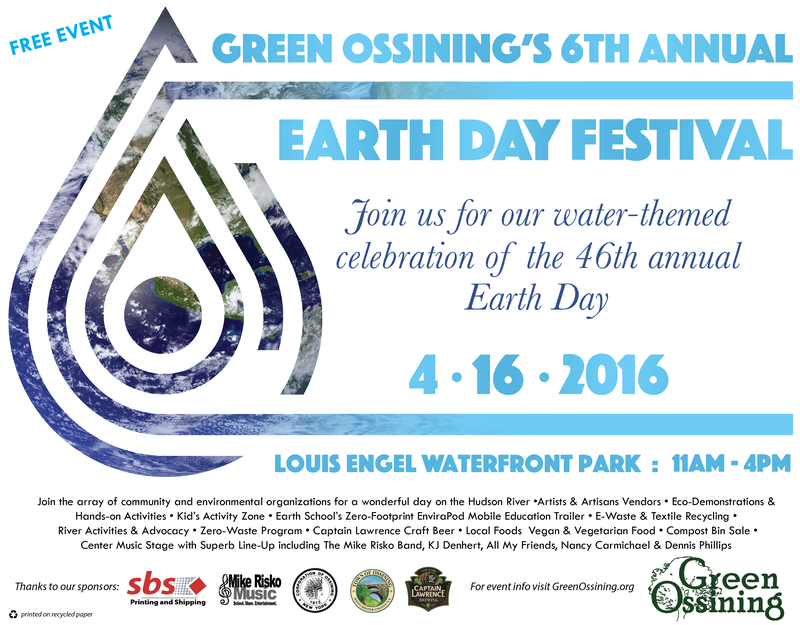 Green Ossining’s 6th Annual Earth Day Festival at Louis B. Engel Waterfront Park will be on April 16th from 11am-4pm. Bring your family and friends. Learn how to live a more sustainable life, visit artisan vendors, and enjoy food and live music on the Hudson River. The Festival has grown from roughly 300 attendees in its first year with an expectation to surpass last year’s nearly 3,000 attendees. 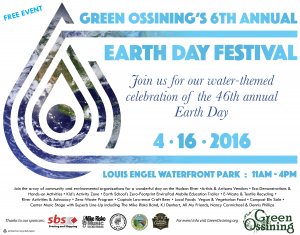 Join the Greater Ossining community in our annual celebration of Earth Day. PLEASE SEE OUR FACEBOOK EVENT PAGE (Green Ossining’s 6th Annual Earth Day Festival) FOR ALL VENDOR PROFILES AND TO KEEP UP-TO-DATE ON ALL FESTIVAL HAPPENINGS! This year, we celebrate the 46th Anniversary of Earth Day with a focus on our theme of a most precious natural resource, water: conservation, appreciation and sustainable living practices of water use will be highlighted throughout the Festival. Craft Beer hosted by Captain Lawrence Brewing Co.
Local “Green” Services/ Product Vendors available for sharing green practices and products. Learn about using eco-friendly products & how to save money by reducing your carbon footprint! Community Organizations: All existing to help you! Learn more about the variety of groups in our own backyard. “As a natural resource, water-related issues have reached global crisis levels. As an environmental organization who seeks to engage and inform, this year we felt that focusing on water conservation, appreciation and sustainable uses of this essential-to-life ingredient would give us an educational opportunity to positively affect change locally. With fun activities for all we’re hoping that everyone walks away from the Festival learning, and pledging to make at least one change in their water usage habits for the better,” said Suzie Ross, Chair, Green Ossining. “Water has been in the news a lot recently. There are exciting stories to tell about innovative, environmentally-smart efforts happening right here in Ossining. What better way to learn, get involved, and celebrate than at the biggest Earth Day celebration in our area?,” said Village of Ossining Mayor, Victoria Gearity. Stay tuned for more updates and about other special events happening throughout the day! For more information , join us on Facebook at facebook.com/pages/Green-Ossining/339309057894, or go to www.greenossining.org/earth-day-festival/. VENDOR REGISTRATION IS CLOSED. WE’VE RUN OUT OF SPACE! I sent you an email several days ago. We are out of space, but I if someone backs out I can contact you if you’d like?! Its unlikely, but I’d be happy to put you on a wait list. Let me know, but either way, please stop the Festival and see what you think. My name is Jeyner and Im an Ossining resident, I know that registration is closed for Earth Day, but is it possible to be on the stand by list in case someone cancels? Thank you in advance! I had sent in an application and a check to be a craft vendor at the earth day festival a while ago, but never heard back about being accepted into this show. Can you please let me know? Sorry about asking so late, but it just occurred to me that we didn’t receive anything from you on this.